All breakout session decks have been posted below. Feel free to share with your teams. Join HubSpot CEO, Brian Halligan and learn where the industry is headed, and get a first look into how HubSpot is evolving to address the market trends. Join our SVP of Product, Christopher O'Donnell as he shares what's on the horizon for the HubSpot product, as well as what we're making available in your portal this Partner Day. You'll gain insight into the new tools being built to make it easier for marketers, salespeople, customer service representatives, and business owners (like you!) to drive growth in 2018. HubSpot is evolving to become a platform — a flexible foundation around which organizations like yours can tailor their entire digital "front office." This next wave of innovation offers three opportunities for agencies: 1. Using our integrations to provide more specialized solutions to clients and wrap new service offerings around them. 2. Developing custom apps and integrations for specific client use cases. 3. Creating your own products on our platform — bottling your experience and insight into apps that can be sold to other HubSpot customers. Consumer behavior is shifting dramatically so HubSpot is evolving with the launch of Service Hub and App Hub. But what does this mean for our global partner community? David McNeil, VP of the Partner Program, will highlight the best ways to take advantage of the opportunity right now by expanding your service offerings and being first to market. Each month, all of HubSpot is invited to see demos of the work being done by product teams. It’s every HubSpotter’s favorite forum -- so we want to deliver the same content for our partners! Join our product team for a round of live demos of both new and soon-to-be-released software. Michael Redbord has spent the last 5 years growing HubSpot support, scaling solutions, and solving for the customer. He's now leading the charge for HubSpot's next product line - Service Hub. He'll share the inbound service framework he's developed, a deep dive into the new Service Hub product, and why now is the time to put the customer at the center of your business. Developing a conversational strategy the inbound way is about more than live chat and chatbots. It’s about building a cohesive, omnichannel experience that enables the development of personal, one-to-one relationships at scale -- without increasing human capital. In this session, you'll learn how HubSpot is changing the game with conversations, the newest feature of HubSpot CRM. Ecommerce is the future. People love the convenience and speed of buying online. This has been great for entrepreneurs and has spawned thousands of new SMBs. And while it’s easy to grow, it’s hard to scale. Pressure from retail giants and a dated marketing playbook are major challenges. That’s where HubSpot for Shopify can help ecomm SMBs win. Attention is at an all-time premium, and it's harder than ever to stand-out. Yet, clients today are still looking for you to deliver growth. Join Angela DeFranco and Daria Marmer, product leads for content and social within HubSpot and learn about all the latest Marketing Hub updates that will help you stand out and effectively turn attention into leads. Have you thought about expanding your service offerings to include sales, but haven't quite made the jump? If so, this session is for you. We'll cover how to sell, price and package sales services as an extension of your marketing services. You're already helping your clients generate qualified leads, now learn the framework and new HubSpot tools that will close those leads at a higher rate. Join Nicholas Holland, General Manager of the Marketing Hub, for an in-depth walkthrough of how far the Marketing Hub has come, and what's coming next that will help you, and your clients, supercharge your growth in 2018 and beyond. As HubSpot evolves as a platform and expands our ecosystem, how does that change our approach to Product? We're introducing extensive new resources for developers, driving for API completeness and consistency, and thinking #platformfirst as we design new features. In this session we'll share our vision for a truly lovable developer platform that will foster a vibrant and open ecosystem, and discuss how this approach will benefit you and your customers. The HubSpot CMS has become a huge growth opportunity for partners, and professional marketers. Recently, we've rolled out a number of enhancements to the CMS that can help you build, and deliver an effective website. Join the Marketing Hub product team for this session to learn about all the latest CMS product updates, and how you can apply them to your agency and clients. Machine Learning is one of the hottest trends in the business ecosystem, but what does it really mean and what impact can it have on the marketing agency world? Join us for an Ask Me Anything style session with HubSpot's very own machine learning expert and technical lead, Hector Urdiales. 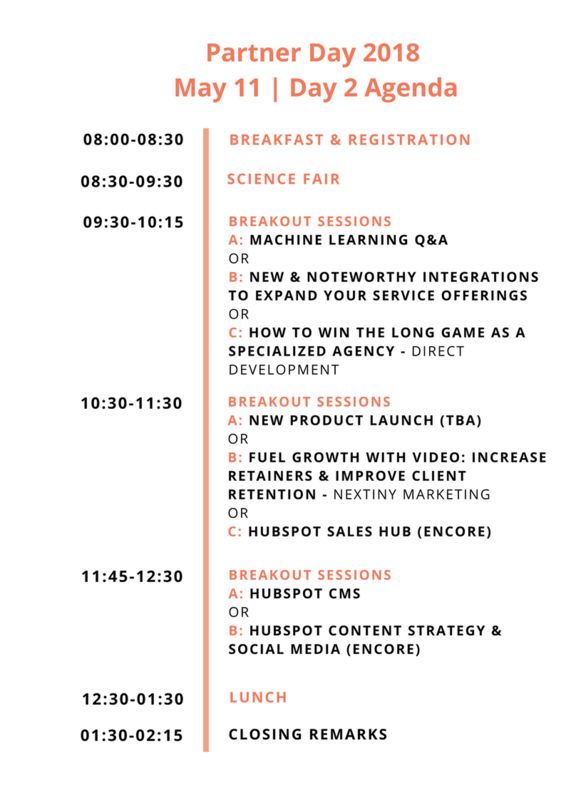 We'll address how HubSpot is using machine learning when developing new products, and conclude with an open Q&A. It’s hard to know where to start with ABM, making it even harder to advise customers on ABM. Kuno Creative, a Diamond Agency Partner, shares how ABM is fueling their business and how they make ABM easy for their customers. Using the HubSpot - Sigstr integration to power ABM in employee email, it’s not as daunting as it seems. Chances are you've implemented a HubSpot Connect integration for a client, but have you considered wrapping a value-added services package around it? Join Al Biedrzycki, Manager of the Integrations Platform Marketing team as he walks you through several new. noteworthy integrations and how you can package them as brand new services for your client base. Agency owners, we know you crave more advice about running your businesses. Great news: we happen to know a number of experts with firsthand know-how of scaling an agency. Hint: they're attending Partner Day too. 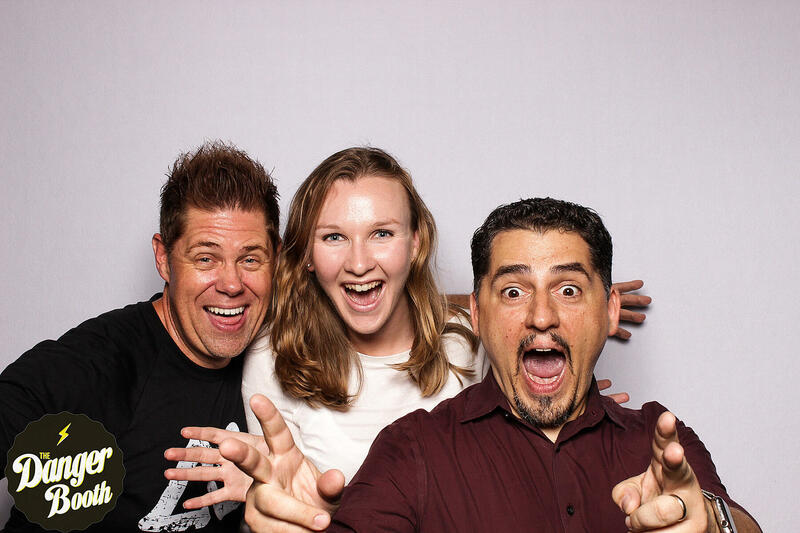 We’re bringing our monthly Agency Unfiltered Facebook series to you in-person! Join this partner-led panel to hear tips on topics like: process development, sourcing and hiring talent, team building, financial planning, specialization and more -- from the experts who know it best your agency peers. Focusing your agency as a specialist for a specific industry or two can make a huge difference in the long-term sustainability of your agency. While this is a great theory, how exactly do you do this well? This session offers two important experiences that will help you grow your agency and win long-standing client relationships with a high renewal rate: lessons learned and an open discussion on how you can implement changes. Eric will unveil how Revenue River grew from a bootstrapped startup to a profitable agency within the HubSpot ecosystem. He’ll unpack the processes they implemented along the way and the approach he took to remaining profitable while scaling the agency from one employee to over 30. "The cobbler’s children have no shoes.” Why is it that agencies excel at providing services to clients, but neglect to do the same for themselves? With the power of HubSpot at our fingertips, there’s no reason why every single agency partner should not be executing inbound marketing and inbound sales. In fact, your customers expect it, and soon they will demand it. Learn how we increased our monthly retainers by 40-50% while keeping our customers happy using video services. Harness the actual and perceived value of video to drive content strategy, social ads, email and more all while increasing your bottom line and your clients. Many agencies can deliver great work, but effective communication is typically their downfall - and it's not all the agency’s fault. We'll share how Impulse Creative increased account/customer retention by moving to a video first mentality in our agency. We’ll discuss why it’s important to implement now, the 3 things to consider, 3 symptoms of it working, technology we’ve implemented, and some key findings we’ve found after our switch. Common pitfalls and mistakes from an agency who has seen them all. Learn to look for the signs that your agency may get fired, and best practices to assure that never happens. John Aiken, owner of Diamond Partner Web Canopy Studio, along with Evan Dean, Principal Partner Consultant, will share signs to watch out for and practices to implement in order to assure your clients are happy and sticking with you for the long run! Partner Day is an annual event that brings together our top agency partners for an in-person experience at HubSpot's HQ in Cambridge. The event began in 2013, and in 2014 we also began hosting an international Partner Summit in Dublin. This year we are expecting 250 partners to attend the event in Cambridge, and another 200 partners to attend in Dublin. Partner Day is an exclusive 2 day event for our top agency partners who have achieved the Gold, Platinum or Diamond tier status. It's the one time of year (outside of INBOUND) that we are able to fully immerse our Partners in HubSpot's culture, product, and the broader partner community. 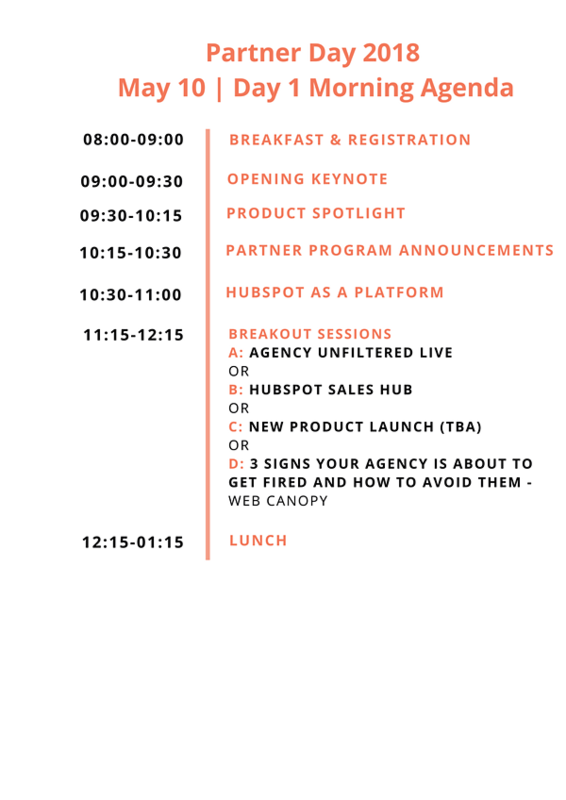 The agenda features HubSpot product engineers and marketers, HubSpot executives, agency experts, and partners themselves. We utilize partner day to sneak peek products features and enhancements, and to train Partners on how they can package and sell their services, and how to grow and scale their agency. It's where I get a more personal experience with HubSpot. I love getting a behind the scenes look at all of HubSpot's innovations. 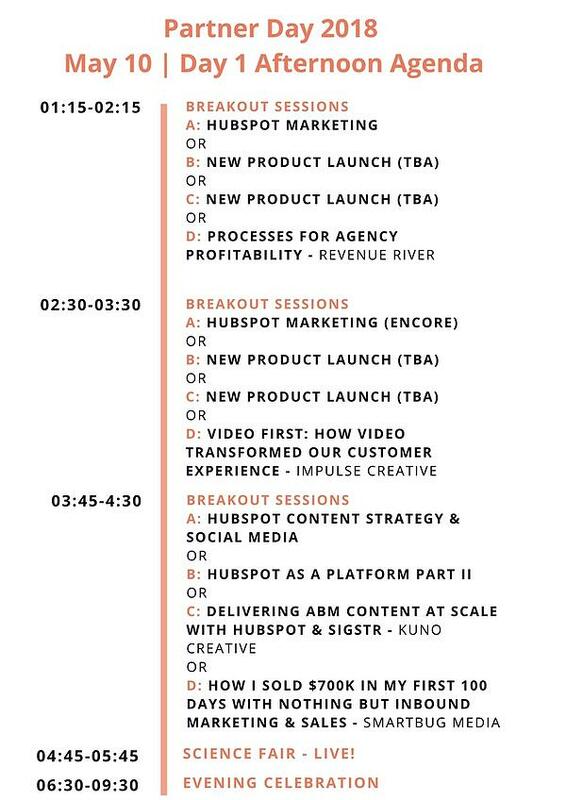 It's another chance to be with other HubSpot partners. This community is what helped us grow, particularly in the beginning.